Jeremy: Thank you for the compliment! A lot of things are different. Almost everyone that knows me or has been around me knows I spread myself way too thin. The overriding theme in my life, pretty much from last year’s Nationals result into this year’s season, was to focus on myself more and stop being a “yes” man to everything I was asked to do…and really would LIKE to do but realistically couldn’t. To reach my goals, I had to stop taking on things that weren’t actually helping me to attain my goals and pay more attention to myself. Things were getting watered down which isn’t what I wanted anymore. I’ve got a much better focus this year and I think it’s paying off. TrainingPeaks: In a recent interview with Pez Cycling News you mentioned that you use TrainingPeaks to self coach. Can you dig into a bit of detail on why you decided to go this route? Jeremy: I am self-coaching at this point and have been since the start of this season. Truthfully, I’ve been creating my own workouts and tailoring them for myself for a while now. Of course, I’m still bouncing my ideas off my good friend and mentor for many years, Alec Donahue. However, I believe there comes a point that many athletes reach, where they understand their needs better than anyone else can – and that’s where I am. At this point, it’s almost more work for me to write out my entire plan, my schedule, my ideas, goals, etc. and then go back over every little detail about this-and-that with my coach. It’s double the work! I know what work I need to do at certain times of the year, and if I’m faced with a difficult travel decision or training block question I’ll ask for Alec’s opinion and we’ll sit down and talk it out. The overall theme for me this season has been to work on everything I’m not good at. Running was a big part of my early season, and continues to be a focal point for me as it gets muddier, and especially as I focus more on the World Cups coming up. TrainingPeaks: Without a coach though, how do you objectively assess what you need to work on? A lot of things happened. I caught a head cold because I was razor sharp from Nationals and then I flew to Europe the next day. I picked something up with my immune system being compromised from such a hard race. So, I’m not going to do that again. I need to build in time to recover before I fly. Getting sick like that ruined most of that end-of-the-season Euro trip for me. I also needed to spend more time at Koksidje venue. And then there was my running, which I was disappointed with. Overall my season last year ended below my expectations after Nationals, because I was exhausted, and I kept digging deeper and deeper and there wasn’t anything left. So this year I put proper breaks into my macro training plan to deal with that better. I also jot down notes all over the house written out with exactly what I know I should be doing. “Stretch”, “Go Run”…things like that to keep my eye on the prize and remind myself, because that’s essentially what you’re paying a coach to do. So when I remember, I write it down! TrainingPeaks: Speaking of writing things down, in the sense of tracking your training, how long have you been using TrainingPeaks? TrainingPeaks: Your suggestion has been noted! How do you think TrainingPeaks has helped you progress as an athlete, and what are the features or tools you use most? Jeremy: My brain jumps back and forth between so many things all the time and it’s easy for me to forget important notes about my training rides. That’s why I like TrainingPeaks so much. It helps me to remember details of when it was that I may have hit certain milestones, times on climbs, power numbers, how I felt that day, down to what the temperature was. For me, it’s been much better than keeping a handwritten traditional diary for myself. I’ve always based my micro training (stuff that’s within the next 10 days to two weeks) on how I feel first and foremost. If I’m smoked tired, I rest versus pushing through the training just to say I did it. Right around July and August, I always map out my season with a big macro picture. That helps me set goals, put the training ideas into the calendar and in place, and then I try to hit those goals. In training, especially in the fall and winter months, it’s hard to have everything go perfectly; for example, you want to go ride four hours on Wednesday but it’s 32 and snowing. I have to make adjustments, but the overall macro plan is what I mostly look at – am I keeping up with my big picture? TrainingPeaks is a great way for me to track my volume for that purpose and something I do constantly is look at what happened in years past, good and bad, and where I need to make improvements. It’s about repetition and refinement when you’re talking about getting juuusst a little more out of yourself. TrainingPeaks makes it so easy to go back and analyze that work. TrainingPeaks: We’re stoked you find the software so useful. Switching gears a bit, you mentioned you’re using road pedals on your cross bike. What have you found to be the advantage there? Jeremy: I have some structural issues, nothing major, a little shim on my left side, etc. With the long miles, I like to be locked in a little more. I ride the crankbrothers pedals all the time, and honestly, I’m actually using them more than I used too, to really mimic exactly what I’m racing on. TrainingPeaks: Can you share a couple of workouts you’re doing these days for our ever-ambitious readers to try? Jeremy: Here’s a file from last season. It’s actually a pretty basic work out. What I do depends of course on what happened during the last weekend of racing, but also the weeks leading up to a workout. Let’s say I want a week with some endurance on a Tuesday and intervals on a Wednesday, but then Tuesday comes around and I’m still too tired to get the work done. Then I’ll combine a little of each for the workout on Wednesday. So it ends up being a long ride with intervals in the beginning, and I make sure I’m doing threshold numbers in those intervals. Then sometimes I’ll do the last minute or minute and a half at VO2 – not so I’m throwing up, just so that I’m hitting everything. It’s like a buffet of training: long ride, threshold and VO2! YEAH. Haha. 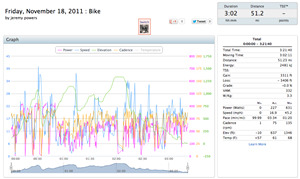 View Jeremy’s full workout in the TrainingPeaks Activity Viewer. TrainingPeaks: A workout called “The Buffet”…I like that. Just one last question Jeremy. If you had one piece of advice for aspiring cyclocross youngsters out there, what would it be? Jeremy: Cycling for me has been an incredible way to see the world, and doing well is extremely rewarding. Not long ago, I passed through my phase of being “the young up-and-comer” and realized that all the tips on travel, organization, and life that I’ve gotten from all those people who invested in me and helped me get to this point, are where all the tools to being my best lay. It’s about listening and not thinking you know everything – many younger riders get caught up in that. Click and save everything you see and hear. It’s a hard sport, but finding that common place of not putting too much pressure on yourself, letting things happen on their own and working hard will get you to the top, eventually. Hire a good coach, surround yourself with positivity, have fun and ride lots. TrainingPeaks: Thank you for your time. We wish you the best of luck for the remainder of the season and beyond! See what Jeremy is up to on his website and/or follow him on Twitter @JeremyPowers and Facebook.